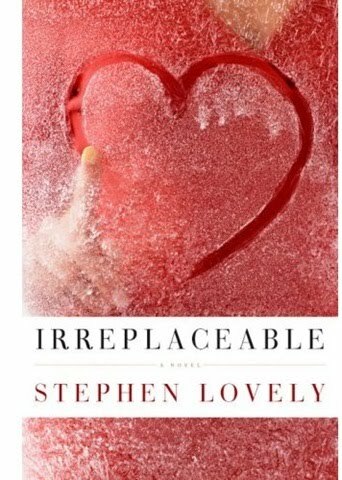 This novel Irreplaceable was one I liked and hated all the way through. And now that I've finished the book, I'm still not sure if I liked it or not. Archaeologist Alex and his scholarly researched wife Isabel have a young marriage and nice starting out life when tragedy strikes and Isabel is killed. She has signed her donor card and Alex grudgingly followed through, and donated her organs. This novel then follows Alex in the year or so following Isabel's death; how he moved on, how he copes, his relationship with his mother-in-law, and more interestingly, the contact he starts receiving from Janet Corcoran, the woman who received Isabel's heart. Janet wanted to thank her donor, wanted some contact and managed to do some research and found out who Alex was. She sent him letters and cards. She managed to connect with Isabel's mother and they emailed. Isabel's mother wanted the contact and valued it, while Alex was appalled and intrigued. Also added to this interesting mix of people and storyline, is the man who was driving the car who killed Isabel. I felt the part of the story that involved him was sick, but, no pun intended, like a car wreck and as a reader you didn't dare skim or skip anything. It was mortifying and disturbing to read his interactions with these characters. I realize this was fiction, but I feel it was a strongly told story it was hard to remember these are fictional people and not voices of real humans. or many, the characters are so real, they could be anyone we know. The story is also told, alternating chapters between the story of Alex, to the story of Janet and her family. It also oscillates between present day lives of Alex and Janet, to flashbacks the the days when Isabel was alive and before Janet received her heart and thought she was going to die. I struggled with liking these people... well, characters. And maybe that's the problem. At some point in the story I was so wrapped up that I thought of these characters as people. And I didn't really like them very much. I think I liked Isabel the best and she was dead and only portrayed in flashback. It doesn't become sappy. It's almost more the other direction, more harsh and maudlin. And maybe in that case, more real. 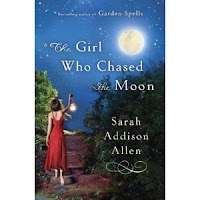 When Emily's mother dies, Emily is sent to a small southern town to live with a grandfather she never knew existed in the book The Girl who Chased the Moon by Sarah Addison Allen. This whimsical story takes place in a mysterious, sleepy little town where wallpaper can change patterns of its own accord, where gentle giants walk the streets, where hope is baked into cakes at the local diner, where the sweet and smoky scent of barbecue hangs in the air, and where a magical light dances in the night woods. Emily can't believe her eyes and ears as she wonders through this town her mother never spoke of. And when Emily finds her mother was an evil, cruel teenager in this sleepy, little hallow, she feels she'll have to accept the magic of the place and accept any torment that comes her way because of her mother's mean past. Emily meets a boy, Win, and falls in love and can't figure out why since they only had a few chance encounters. There's her next door neighbor Julia who bakes magical cakes but she is hurting and wishing for more in her life, wishing for a past she could never have; therefore planning her future in detail. There's Stella, the woman who had and lost it all. There's Sawyer, who is sad and handsome, and wants Julia for more reasons than she can fathom. This is a an irresistible story, sweet and simple, full of magic and serendipity and delight. A little of a modern day fairy tale, a little sweet, and just perfect, it's a great novel. Deliver Us From Evil by David Baldacci is an excellent thriller, and apparently the second book about secret government operative Shaw. In this outing, Shaw runs into a private group who is killing Nazi survivors. He meets Reggie and her crew while they are working and the plan goes wrong but he's there to help. Now Shaw, Reggie and her crew are up against the name who was the actual real Butcher of Kiev and the meanest more despicable person on the earth. He is truly evil. And vile. This is an excellent thriller and in some spots, it's a rough read with the violence and gruesome torture methods explained in the pages. I loved this book, Beachcombing for a Shipwrecked God by Joe Coomer. I don't know what it specifically was that made me fall in love with this novel, but I certainly did. It was wonderful. It's the story of three women who are strangers. They end up living together, renting room on a house boat together. Charlotte is a young 30 something newly widower archaeologist. Grace is a septuagenarian landlady of the lot. It's revealed she's suffering from Alzheimer Disease and within the story she loses her memory to a different medical ailment. Chloe is the over weight teenager who fled her home and is facing an uncertain life. Told with grace and humor, this quirky story is engaging to the heart and soul. The three women go in a spiritual journey together as well as a real, physical journey aboard the boat in an effort to save themselves. I loved the voices of the women and the way the characters all seem to just spill from the page. It was lyrical at times, and often humorous in that bumbling sort of way. I love the hunt the women were on, the tie to the past but the need to go into a future of some sort these ladies discovered. The fact that Charlotte is an archaeologist helps beautifully tie this theme to tangible elements of the story. I love the ebb and flow of the storyline, and setting it on the water in New England made this an extra special book for me, since I love that area. I fell in love with this novel!